In 1958 Elvis Presley was drafted into the US Army where he spent his time as an ordinary soldier, a reflection of the Faulkner and Eisenhower culture of the times. The world didn't change with the flick of a light switch in 1960, but it was a different place with a young John F Kennedy elected president, Bob Dylan quit college to tour with Woody Guthrie, Jerry Garcia amassed enough time AWOL to get a general discharge from service, and the seeds of the anti-war movement were germinating. It wasn't just culture that changed in early 60s, it was also a pivotal moment for the automotive industry --just look at how different the 1959 models were from the 1960 cars. They went from standing tall with chrome & fins to a much more streamlined, hunkered down look in 1960 with nothing above the trunk line. 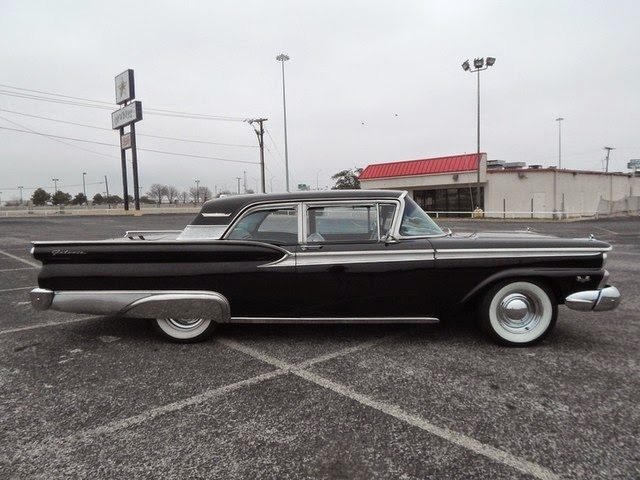 Nostalgic for the slick hair and pressed suit era -- buy this 1959 Ford Fairlane 500 Galaxie with 429 Cobra Jet power offered here on eBay for $17,995 buy-it-now located in Arlington, TX. This '59 comes from the last of that era when you'd expect to see brylcreem and rolled up blue jeans, and getting more into long hair and being too cool for everything. It looks like a decent older restoration that is starting to show its age, but seems very solid from a mechanical perspective. It has A/C and a cool period look with fender skirts, chrome -- sorta like a black/white penguin tuxedo. 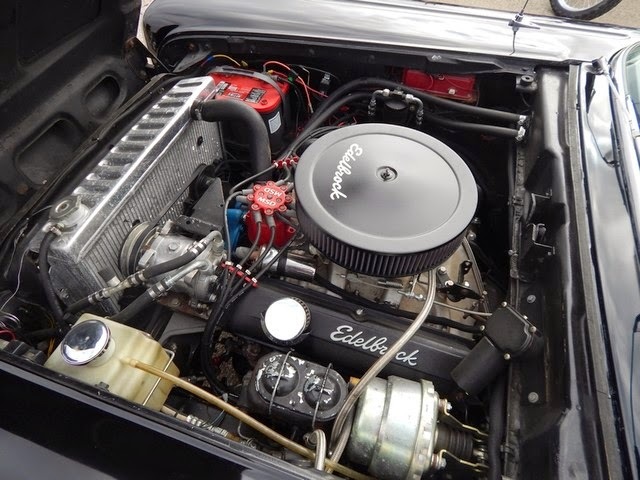 The 429 V8 is part of Ford's 385 engine family (named for the 3.85 inch crank stroke of the 460 V8 version) and sold new sometime between 1968 and 1973 (I could be wrong on the ending year...). It would have been called something like Thunderjet (2-bolt mains), CobraJet (4-bolt mains) and SuperCobraJet (4-bolt mains with forged pistons) and made 350ish horsepower when new. This one has had who knows how many modifications and could be good for quite a bit more. (Side note: This might also be a 428 CobraJet from the older FE engine family if you believe the verbage on the sellers website, as opposed to the eBay listing...maybe someone with the latest Spotters Guide to Big Block Fords can chime in the comments). 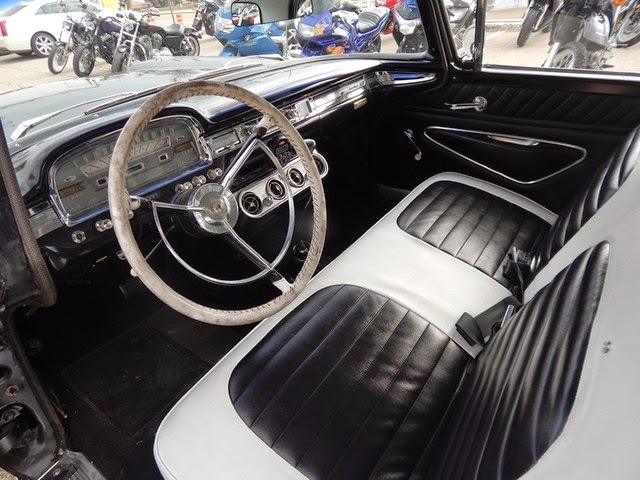 The interior looks good except for the grimy steering wheel cover and what looks like a marine radio bolted unceremoniously to the middle of the dash. Additionally, it sounds like they're suggesting it has a roll down rear window which is difficult to verify in the pictures. Chris, I am looking at the round display with buttons between the original Ford push-button radio and the vintage air system under the dash. That round display says "Audiopipe" or something at the bottom and has Vol+, Vol- & scan buttons, but I've never seen something like it in a car before. Here it is: Audiopipe marine radio.